The Savin 2522 is a smart digital document management system that is customizable to adapt to any small or medium business need. The base unit starts with a digital copier and network printing, color scanning and faxing options can be added as needed. Precise document reproduction, reduction of paper and toner waste, image manipulation and editing, user security and workgroup sharing are just some of the many features available that add convenience to reliability and durability. A digital copier module with a dry electrostatic transfer process and resolution up to 600 dots per inch provides quality reproduction of business documents such as invoices, memos, reports and letters. 32 MB of copier memory is standard, which is upgradeable to 64 MB, allowing enough memory capacity to handle even the most complex copy jobs. An additional 6 GB hard drive provides storage for thousands of pages of documents that can be accessed on demand. Copy and print jobs can be completed at a top speed of 22 operations per minute for letter size documents and first copy time is less than 5 seconds, providing quick results for people who need to copy on the fly. Standard paper input capacity is two 500 sheet trays and a 50 sheet multipurpose tray. More paper banks can be added to increase the total paper input capacity of this unit to 3,100 sheets, which can handle a full day of printing without having to re-load paper trays. 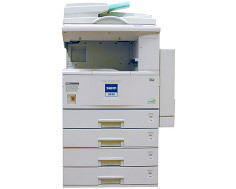 Standard copier features include auto paper select, auto magnification, series copy, combine mode, cover insertion, negative/positive, electronic sorting, auto tray switch, date stamp and page number stamp. 100 user codes are programmable to secure copy functions in public places such as libraries and government offices, restricting access to authorized people only. An optional printer module has a standard memory capacity of 32 MB that can be upgraded to 64 MB, and the optional 6 GB hard disk drive can be shared with the copier, providing enough printer memory to handle the most difficult and complex print jobs. An optional 10/100Base-T Ethernet adapter can connect to virtually any network with the TCP/IP, IPX/SPX, NetBEUI and AppleTalk protocols that are included. Supported operating systems include Windows 95/98/NT 4.0/2000/Me/XP and Mac OS's from version 8.6 forward. Standard printer features include form overlay and watermarks, and optional features include secure print, locked print and sample print. Scanner options include software that can accommodate two types of image scanning and management. ScanRouter V2 Lite drivers can scan pages at up to 42 scans per minute and TWAIN drivers can scan at up to 29 pages per minute. Scanning features include scan to file, scan to in-tray, halftone scanning and message attachment. Duplex scanning is optional, allowing a user to scan both sides of a document automatically, with the option to print or digitally transfer to a network resource. 256 levels of grayscale limits the quality of copied graphics and images, producing results that are often grainy and pixelated. This device is mainly suitable for text document processing. The standard 500 sheet output tray can only handle one sixth of the total possible input capacity, which is not sufficient for larger print or copy jobs. The 1,000 sheet finisher must be purchased to accommodate larger runs. Installed printer language emulations do not support Linux operating systems and printer drivers are not guaranteed to work on Windows Vista and 7 systems. Although this model can send digital copies of color documents to Windows network resources, image management software is only guaranteed to run on systems with Windows operating systems as current as Windows Me. Review it: "Savin 2522 "
Replacement black toner can be purchased for the Savin 2522 in refill bottles that provide an average yield capacity of 11,000 pages. 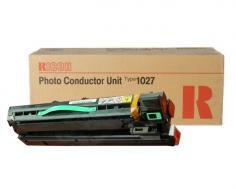 Replacement drum units are sold separately, so they do not need to be replaced every time toner is replaced. 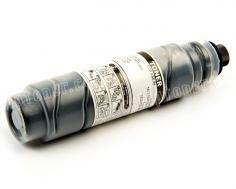 This reduces costs by allowing consumables to be used to the fullest of their capacities. With average toner prices, printing can be done at a cost of one cent for 5 pages.